Another week and another exciting parcel in the post!! This time from a brand new vape company that does things a bit differently. I have been vaping for 3 years now, from the day I got my first vape I put down my last cigarette. I haven't smoked a cigarette since. The world of vaping is a strange one though, it can be intimidating, like walking into a tattoo shop. The atmosphere around vaping is one of grunge, edgy kids billowing competitive clouds like hipster steam trains. I'm not really about that. I started vaping for the sheer fact that I wanted to stop smoking. That's where Vapelista come in. They supply a whole new approach to vaping that is far from intimidating. They take the hassle out of scouring the internet to find a 'pen', you don't have to worry about Ohms or wattage (thank goodness). So, Vapelista offer a complete starter package, then a liquid subscription service so continuing is easy as pie. You have the freedom to chop and change your flavours and nicotine strengths on a month to month basis. All of this started at just £19. Which is INSANE. I was lucky enough to give one of these bad boys a whirl and I must admit, Let's me run through exactly what you can expect. 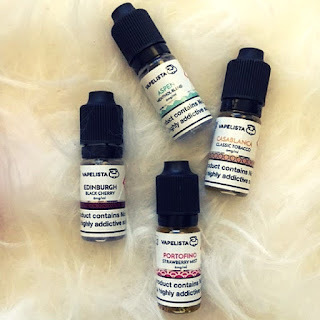 There are two package options when you subscribe, you can either get The Starter Kit which includes one liquid (£19.00) or The Personalised Discovery Kit (£29.00) which contains 4 liquids, this is the one I will tell you about. So, the box comes beautifully packaged, it really does feel super special. Inside you get your instruction booklet, your pen (nicely wrapped in tissue paper), your 4 liquids and your velvet pouch. The Discovery Kit is great for anyone just starting out to find out which flavour is perfect for you. The flavours are Casablanca (tobacco), Portofino (strawberry), Aspen (menthol) and Edinburgh (black cherry). My personal favourite is menthol, always has been, always will be. The carry case is a really soft velvet case which is a great idea to include so as not to scratch or dent your pen, it also keeps anything gross getting in the mouthpiece when it's in your handbag. The pen itself shocked me actually. I was super surprised to see it was from a reputable vape brand that I know well and have previously used myself, E Leaf. E Leaf are one of the leading makers of vape pens so you really are getting quality for your money. The pen I received is red but you have a choice of colours including red, gold, cyan, black and white. So it's sure to suit every taste! The vape pen is super slimline, just thicker than the old school iPod Nano and really small! It's actually pretty adorable. It has a metal finish and feels pretty hard wearing. I'm a bit in love. I usually use a big bulky machine, which, can be quite embarrassing in public but this eradicates that issue entirely. The pen isn't at all complicated, the instructions to fill it are simple as pie and written so clearly in the booklet. The window of the pen glows red when it needs a charge and then you simply connect it using the supplied USB charger. Awesome. Inside the pen box you get one coil to start you off and a spare, which should give you plenty of vape time! The experience I have had with this kit has been nothing but positive. The pen vapes really well and will only begin vaporising when you inhale which means no weird crackling in your handbag when a button is pressed by mistake. The liquids work beautifully with the pen and create a nice amount of vapour, which in certain circumstances can be discreetly exhaled. The liquids have a really well made flavour, they don't taste like synthetic flavourings like some of the liquids I have tried and don't leave me coughing or with a bad taste in my mouth. All in all I would highly recommend this vape to every and anyone. Whether you are a seasoned pro or a newbie to vaping, you will really enjoy this kit. The subsciption aspect takes away the hassle of remembering to buy liquids and the intimidation of going into a vape shop and the kits come with everything you need to get started in minutes! This company, their ideas and their execution is 10/10 for me. Go on the website now to sign up so you can get your kit when they launch! !